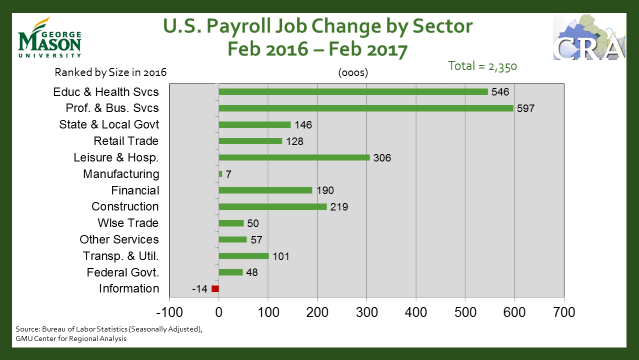 February National employment numbers were released this morning, providing the first picture of employment numbers under the Trump presidency. 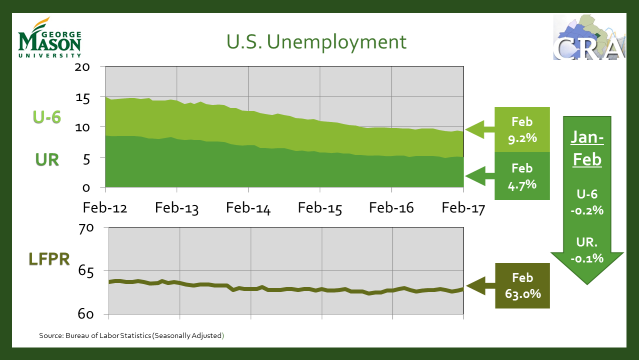 The US economy added 235,000 jobs and unemployment remained relatively unchanged at 4.7%, down from 4.8% in January. All sectors grew from February of last year except the information sector, which has seen consistent decline in the past year. Both labor force participation rate and the U-6 unemployment rate have remained steady at 63% and 9.2% respectively. January employment numbers for the Washington Region MSA will be released in one week on Friday, March 17th. Expect an update from CRA on the region’s economy at that time.